Over millions of years, natural life has evolved to live together in communities. In the different regions of the world – on land and in seas – there are different natural communities with distinct characteristics. If animals, including fish and birds, or plants, from a distant community get into the UK or its seas, they may not fit harmoniously into the local natural community. For example, American lobsters and Dungeness crabs live in communities off the coast of North America. Some of these non-native creatures were released into the sea near Brighton in June 2015. There’s a risk that such non-native species could spread quickly, establishing breeding populations. These could threaten the UK’s native lobsters and crabs by introducing diseases to which they have little resistance or by out-competing them for food and shelter. Any loss of our native lobsters and crabs could seriously affect the livelihoods of individual fishermen and the viability of local businesses. Losses would also disrupt the wider marine ecosystem. Following the release near Brighton, fishermen have been trying to catch the American lobsters and Dungeness crabs to minimise damage to the communities of native crabs and lobsters they rely on for their income. In the interests of protecting the natural environment, it is a criminal offence in the UK to release non-native species into the wild. This includes mammals, birds, fish, amphibians, lobsters and crabs, as well as plant communities. The release of any non-native species can cause the death of native species through competition or disease. 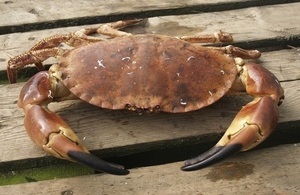 Releasing native species, for example European lobsters and brown crabs into the seas around the UK means that they fit into the local sealife community. Anyone wanting to release lobsters, crabs, or any other species, should first check that they are species that will live harmoniously in the UK’s natural communities.